Ultimately it doesn't matter what camera you use, nor which film you've got loaded, it's what is in front of the camera that matters. Your subject is the one thing you can't buy - and the one thing that you usually can't repeat. 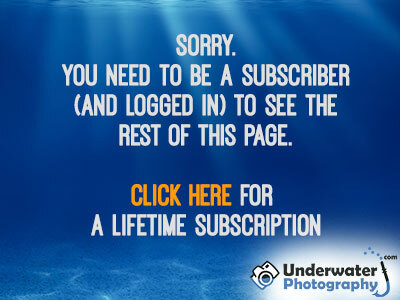 In many respects, the underwater photographer is only as good as his/her subject matter. Indeed, an 'eye' for photography can be thought of as being the ability to photographically define a subject. In this chapter I am going to discuss the various methods with which you can give underwater subjects a sympathetic treatment. Subjects inevitably fall into separate categories and can perhaps be most conveniently defined by the special interests that divers and the public have (which creates a demand for underwater images in the first place). Or, perhaps even more importantly for the competitive photographer, categories can be defined by the most common categories used in competitions! It could be equally valid to classify underwater subject matter by the focal length of the lens used. Also, on a broad level, subjects do tend to divide up into marine life (both vertebrate and invertebrate), scenic shots such as wrecks, and divers. I intend to treat macroPhotography of smaller subjects shot (between 1:1 and 1:3) on macro settings or with macro equipment and close-up photography as subject areas in their own right.